Don’t be misled by the ‘simple’ name, this is anything but a simple dish. Cook the pasta al dente in lightly salted water. Follow the timing instructions on the package. Drain the pasta and rinse with cold water to avoid that the pasta sticks. Cut the onions into small blocks. Peal the tomatoes and remove the seeds. Cut the tomatoes in large portions. Preheat the oven at 225°C. Melt the butter in a pot, don’t let it brown, and mix with the flower. Add a third of the milk and bring this to a cooking point while stirring slowly. At the cooking point, add extra milk to get the correct sauce density. Turn down the heat a bit. Add the thyme and the bay leaf and cook the sauce gently for about 15 minutes. Keep your eye on the ballgame. Sauce on a milk base easily sticks to the pan or overflows, so don’t stop stirring, don’t leave. Sieve the sauce and mix the grated cheese with the sauce. 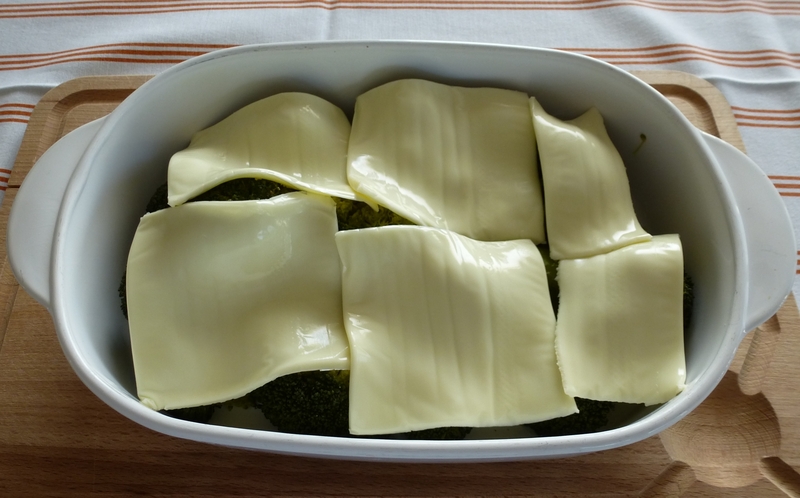 Take an oven dish and put in a layer of pasta. Distribute the onion, the tomato and the minced meat on top. Season with salt and pepper. 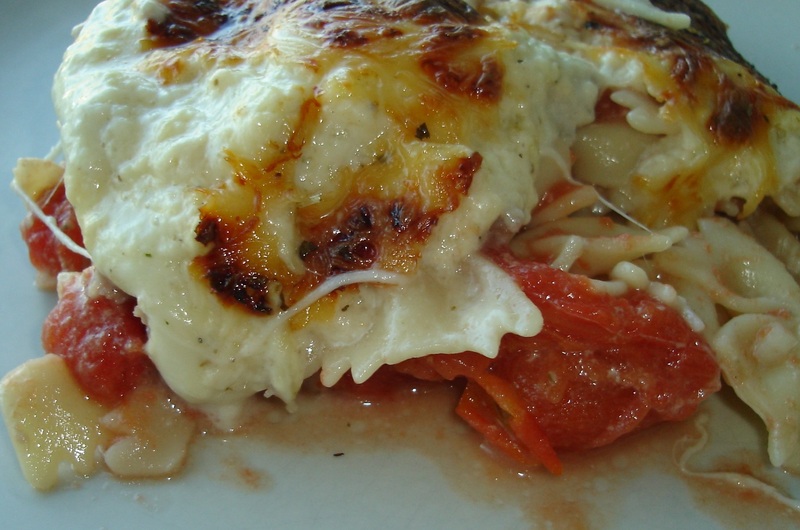 If the dish is not full yet, add the rest of the pasta and cover it with sauce. In case you have some leftover grated cheese you can sprinkle that on top. We often replace the fresh tomatoes by canned tomatoes to save time and it has little effect on the end result. All together this dish takes quite a while to cook. You wonder if it is really necessary to stir in that sauce for 15 long minutes. 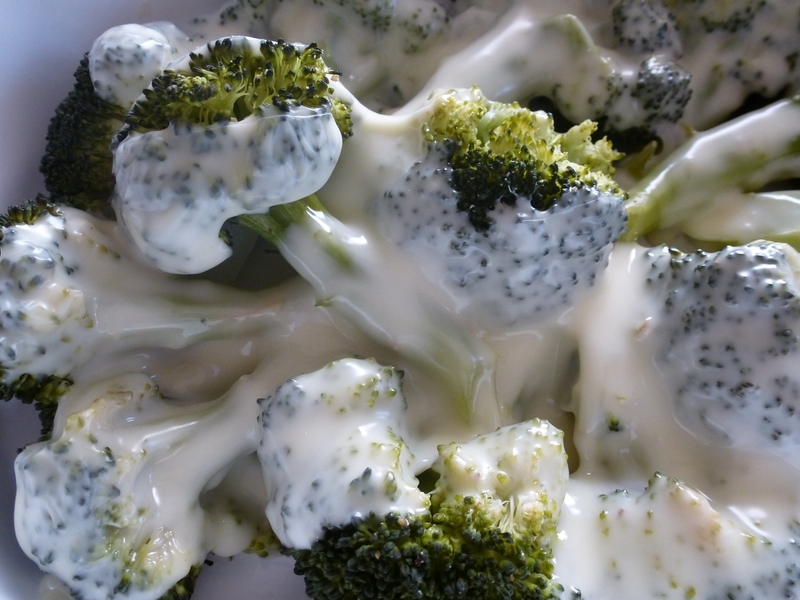 Believe me, it is exactly that herb-flavoured cheese sauce which lifts this dish from being ordinary to being incredibly fantastic. If you do make the effort of cooking this on your busy week day, bear in mind that you can easily prepare some extra dishes and put them uncooked in the freezer for later use. I will confess that this recipe comes from a very old ­ actually our very first ­ cook book which came for free with our very first micro wave after we just got married. Because this is a recipe I never came across ever again I felt I should make an exception to my rule not to blog recipes from other cooks. Just to make sure it gets some extra exposure. I can’t leave it to disintegrate with the book. Now that we finally are getting some sun in Belgium, after all it is only June 3rd … the barbecue can come out of the garden shed. A BBQ meal ever so successful for the lover of meat, are grilled spare ribs. Like the Americans say ‘the rack of ribs’. In Belgium the rack of ribs is actually cut in half lengthwise and one rack is about 10-15 cm wide and 30-40 cm long. Just the size an average person can dispatch during an evening diner. Ribs are always great, served as ‘finger food’ with the aperitif as appetizer, or as a main dish served with a jacked potato with some sour cream or garlic butter, and a simple green salad and tomatoes. Simple, cheap and a definitely a treat deluxe. The following post is not about grilling, it is about marinating. If you want to surprise your audience, marinate your spare ribs in advance. These are 2 of the summer marinades my hubby specifically developed for ribs. 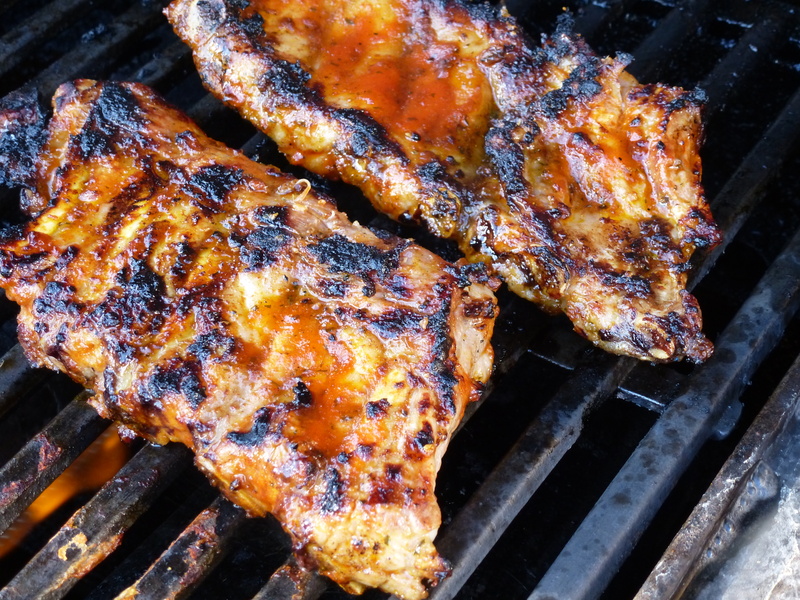 Cut the garlic, squeeze the lime and mix the marinade ingredients and smear them on the ribs. Cover up the ribs and keep them in the fridge to marinate at least 2 hours before you grill them. You can even prepare this the evening beforehand. When it is time, grill the ribs and use the left over marinade to baste the meat from time to time while you are grilling. You can use one of these modern heat resistant kitchen brushes. Et voilà, you can discover for yourself how different the 2 preparations taste. I you can’t find the smoked paprika, you can improvise by mixing regular paprika powder with cayenne pepper. Each year we dedicate our first weekend of summer to contribute to one of our town’s festivals ‘de Zomerfeesten’. Our contribution is limited the hard work of serving mojito’s for 3 days. Depending on the weather, mojito sales vary from good to extremely good. In one of these not so extremely good years we ended up with a lot of left over limes. After having preserved a large part for use in the winter tagines, my husband kept on searching what he could do with them. Apart from the obvious lime sorbet, the ‘distinguished’ marinade was invented.